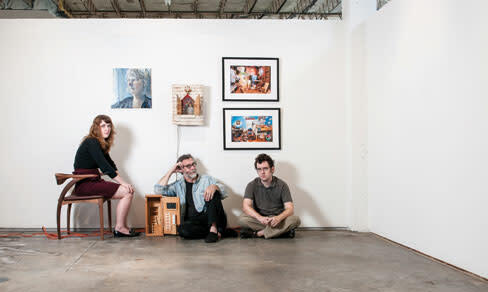 A new generation of artists and their parents is featured at the IceHouse artspace this month. Molly, Kevin and Ian Dean with examples of their work. Does artistic talent run in the family? It seems so, judging from this month's show, All in the Family, at the new IceHouse contemporary artspace on 10th Street. The show, curated by artist Tim Jaeger and on view Jan. 9-19, focuses on the multigenerational artwork of several artists with a Ringling College of Art and Design connection. Jaeger himself graduated from Ringling College and works there today at Selby Gallery, and he wanted to showcase some of the school's instructors—as well as their sons and daughters who are themselves Ringling grads or currently enrolled there. "The concept originated from the desire to create dialogues commenting on familial relationships in current art and art history," says Jaeger. Included in the show: prints by Patrick Lindhardt and photography from his son, Matthew; sculptures by Mark Anderson and drawings by his son, Jarrod; painting and sculpture by Steven Strenk and prints by daughter Bianca Rylee; an installation and seldom-seen two-dimensional work by Kevin Dean, along with photography by his son, Ian, and drawings and paintings by his daughter, Molly, a third-year Ringling student. The IceHouse, which opened in November, is a collaboration between Sam Alfstad, a former longtime New York advertising agency creative director, and his daughter, Casey, who, as Alfstad & Productions, have leased the 8,900-square-foot historic building to serve as a venue not only for exhibitions but for "reimagining how to make and market art." "We want to challenge people to knock our socks off" with what they create, says Sam Alfstad. "The dream is that people will walk in with ideas for the space, saying 'I could do this or that,' and it may be work out of their usual comfort zone. What you will see here is what's not usually seen in Sarasota." The IceHouse setup is flexible, with movable walls, and complete with spaces for artist talks or watching videos of them and their work. There's even a gift shop with T-shirts, posters, books and more. Ready for the next generation of artists? For more information about the IceHouse and this month's show, go to alfstadand.com.